Preparing food is not just about yourself and others. It is about everything. A thief entered the house of a Sufi and found nothing there to steal. As he was leaving, the dervish, sensing his disappointment, threw him the blanket on which he had been lying. Fishermen have hauled their nets and gone. The crows of dusk, in pairs, all flown. Thin clouds, a ragged gown. 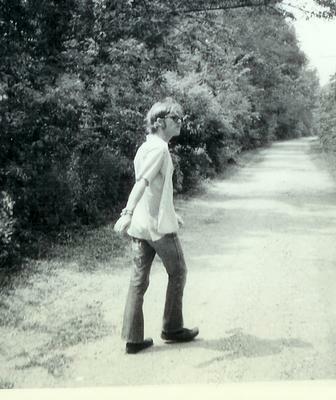 The photo, taken by Ivy Clear, is of the author, on the road and a bit zonked in the summer of 1971. This would make the man, despite all appearances, aged 31! There are times of loneliness, brought on by and/or bringing on the use of intoxicating substance, when one can feel a bond of friendship with that bottle, that pipe, that syringe. Ever since the first primitive man fell face down into a puddle of some kind of fermentation, and came up with a feeling of giddy well-being, men have wondered about this sense of relationship---and sometimes even given it a name or worshipped it as a god. Tribal man was very careful about it, and only designated holy people or times of the year that were appropriate for altered state indulgence. Violations were extreme taboo. In our society, where every man with money in his pocket is king and shaman, and every woman at least priestess of her medicine cabinet, a little fling can be anyday, all day. We are more ambivalent, it seems, about alcohol than nicotine or caffeine or various "recreational" drugs. Drunk jokes are greeted with hilarity, and comics often have scored with depictions of the falling-down inebriant. Lenny Bruce, no stranger either to addiction or loneliness, used to make fun of comics who did that kind of souse, preferring instead a tougher target which he called the White-Collar Drunk. Here we have an imbiber who thinks he has the demon under control, drinks only according to a schedule he makes up, and "knows" he can stop anytime he wants to or has to. I knew a self-labeled alcoholic once who warned me about that attitude. He lived in a prosperous Connecticut suburb, and had his rule, when he was drinking, that he always would keep an eye on the guy at the bar who was worse than he was. As long as there was somebody in there, clearly more far gone and stupid than he, it was OK to order another one. The problem developed that eventually he became the drunkest in the bar, night after night. What did he do? He went to another bar---where there was someone again worse off than he was. Thus, he warned, begins the terrible decline into the abyss. I mentioned before to some of you the afternoon I spent just outside New Rochelle, with Connecticut to the east and the boroughs of New York to the south, with a man who just had been fired from a job at a place we both were working. I gave him a ride to the bus station, where he told me he was going to The Bowery to live. Most people around the world recognize the name as the end of the line for the homeless and addicted. I couldn't believe that here was a man apparently making a rational decision to go there. He had begun his "serious" drinking some years earlier up the Hudson River around Poughkeepsie. Bar by bar and town by town he had descended to this point---and now there was nowhere left to go. Besides, he said, all his "friends" were there. I've known people who, upon giving up drinking, took a bottle or 2 out to the backyard, dug a hole, and buried them as a funeral. It was the death of a best friend...and a time for grieving, of mourning. Such a strange romance...or is it a more serious deviation? Sometimes this kind of perception is called "stinking thinking." Sometimes it is proof that one has gone insane. After all, I remember a seizure of paranoia during which I gathered up my "evidence," shoved it in a plastic bag, crept stealthily outside, and threw it all down a sewer. So, what is the truth about "managing" one's unprescribed drug use? The most difficult part about such a plan turns out to be other people. As soon as one begins to move with a pack, in the teen years, one finds the question coming up. Do I or don't I? Parents realize that a decision like that is one of the most difficult in one's entire life, and probably have prepared somehow for it. Maybe there has been a talk about drugs and booze, and the urgent plea set forward for the child please to consult with them---or at least inform them when the experiment has happened. But what, for some reason or another---what if they don't tell you? What if they can't? Allow me to state my credentials. I have been married twice and have 4 children, 3 of them now over 20 years of age. All 3, at some time or other, have caused me extreme stress regarding substance use and possible abuse. There have been accidents, injuries, arrests, lawsuits, psychotherapy bills and insurance premium increases. But I've been through some of that mess in my own life too. I also have worked in the field of rehabilitation somewhat, especially young people in a psychiatric hospital setting---and during the big LSD years. My mother probably was addicted to Coke or Pepsi (caffeine) but otherwise neither of my parents used any substances at all. However, it is said that my father's father and nephew died with alcohol-related conditions. I have been in one live-together relationship where drugs definitely were a problem, and people have complained about my use of this or that from time to time. For most people probably, relationship with a fun-loving crowd amounts to a drink or 2 at various gatherings. That seems to be normal, and not a problem. Obviously what I'm writing about in this essay is a situation where use becomes so prevalent that one must begin to deceive those around one. "How much did you have to drink?" If a lie or evasion is the answer, the real trouble and challenge of addiction begins. Now deception enters the relationship...and the suffering of those deceived is inevitable. At some point probably---unless the user is honest enough to break off the relationship in favor of the substance...and I've never heard of that happening---the partner or parent thus cheated may worry about something and become suspicious. But we give loved ones the benefit of the doubt and therefore love itself enables disintegration. Through this part of a relationship like this, many of us chart the saddest moments of our lives. The thing about an addicting drug is the "hit." For some drugs, that moment is so extreme that people get sick. Certainly that is true of nicotine. Some researchers say that cigarettes are the most difficult drug to learn to take of them all. And yet that hit was so important that we struggle on to get ourselves using. Once you've had the hit, your system has been changed. Now let's be realistic: what does that mean? It means that your perception has a "higher" notion of what high is...and that's that. What was previously thrilling as high just isn't as much anymore. Nothing very hard to understand about that. The "hit" means that the drug takes you there...and you don't have to do anything. It's a ride, it's a trip...and if you have the ticket, you can go. As someone who has been around high schools very recently, and one who maintains contact with physicians who treat addiction, I can tell you there are 16-year-old students who know the up-to-the-minute pharmaceutical lexicon with breathtaking accuracy. That is not an easy thing to do these days, with medications that pass in and out of fashion like shoes and hats. But young people do it...and can place orders at school for particular mood altering pills in the morning and have the package handed to them as they board the bus home. With such subtle medications in your child's or partner's system---over a period of months or years---you will find it impossible eventually to know who you're talking to. The fact is your crisis has become you're not talking to anyone anymore; you're talking to a drug. It is in these moments that relationship falls to pieces and someone is ordered out of the house. The great agony in trying to save a relationship that has come to this is whether to call the police and force a detoxification. Obviously there can be legal problems with doing this if your child or partner is over 21...or 18 even. With a child under 16, you may have to press a charge like delinquency. Do you want that? Besides, I can tell you many stories of kids who were locked up by parents for years, and one in particular who came in addicted to heroin, who said to me as he walked out, discharged after 3 years, "You never touched me." He went straight to his fix. Many folks in AA say nobody shakes addiction until the person him/herself wants it---and wants it bad enough to go through the Hell necessary to get straight. But there are other people who want to be "made" to stop...and who will blame you if you don't "care enough" to lock them up. What a horrible dilemma it is! I know what choices I've made, but I don't know if ever I will be sure they were right. I think you do the best you can...which means you offer all the alternatives and opportunities you honestly think up---enough at least so that your own conscience is as clear as you possibly can make it. And if the relationship is lost, you grieve and you mourn...and it may go on the rest of your life. Let me end with some positive advice though---if you are in such a relationship, as partner or parent, or if you are in love with a substance yourself: Alcoholics Anonymous exists around the world now, and it does so---well, anonymously. However, its groups are listed in every telephone book...and you can find a local meeting easily. Some of them are called "open meetings." This means anyone can go there out of curiosity or whatever, and see what happens. At every meeting, someone opens up and tells a story about his or her own involvement in addiction, that you will realize is some of the most honest talk you've ever heard. You may discover healing in that process...and any of those people will be glad to tell you in a couple of words how to get it. As to the rest of the journey, you're in my prayers...and God bless. I am an alcoholic. I drank for 6 years about every night at the bar right after work. I was newly divorced and looking for love, but shy. The drink awakened freedom to express myself. I found something that took away my shyness but gained an almost impossible friend who just wouldn't go away. I hit my bottom, the blackouts,fights,car accidents,nights in jail, high insurance costs and finally my job told me to get help or be fired. AA is wonderful when your ready to quit, which I was, and therapy along with it helped me become strong enough to cope with things that came along so I didn't keep them as extra baggage any more. Nor did I keep the guilt hanging over me. I know from experience that until the person is ready to fight for their lives there isn't much we can do for them. Getting brutally honest is a hard thing to do when your used to lieing to yourself and everyone else who thinks you might have a problem. I tested my waters since 1994 the year I sobered up, and I know that I can never drink again because the binge drinking will always be there. I used to have dreams of hiding bottles with the feeling of selfishness. Later my dreams turned, I refused the alcohol, then I knew I was going to be ok. I believe its not only hereditary, physical makeup, but also emotional problems that makes one an alcoholic, with support and therapy you can make it back. I'm a mother of 3 who each experimented and one still does with drugs and alcohol. Their father and myself both have the gene and the emotional background that gives them the added capacity to use. I give this information for understanding and maybe shed some light on a very hard problem that many people face. There is no true stereotype that fits here but with more information you too can make a wiser choice on handling something this devastating in your own life. Please seek help and stop torturing yourself and others.